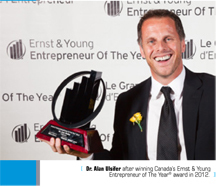 In an industry well known for its conservatism, Dr. Alan Ulsifer is an anomaly. An innovator and a maverick, the founder and CEO of Calgary-based FYidoctors doesn’t mind stirring things up as he works to advance the interests of the more than 400 doctors who are part of the FYidoctors and Vision Source Canada platforms. Consider the company’s recently announced joint venture with VSP Vision Care Canada (VSP). The joint venture, which gives FYidoctors access to Canadian patients covered by VSP’s vision insurance program, combines the latter’s employee benefits platform with FYidoctors’ extensive network of independent optometrists across Canada, including its Vision Source Canada franchise locations. VSP’s role is to market, sell and administer its vision care insurance platform to employers across Canada. In turn, employees of these organizations can seek care from FYidoctors’ network of optometrists as well as its Vision Source Canada franchise locations. FYidoctors will also, subject to strict criteria, allow access to independent eye doctors outside the core of FYidoctors’ companies. Creating the best possible visual outcomes for its patients while striving to ensure that optometrists, not corporations, define what eyecare looks like in Canada, is the raison d’être of FYidoctors. Later that year, Ulsifer led the largest corporate merger in Canadian history, based on the number of companies involved, with more than 80 professional corporations joining forces to create FYidoctors. The company now has more than 1,400 staff, including about 280 optometrists across 109 FYidoctors locations coast to coast. And last fall it acquired the Canadian assets and operations of Vision Source Canada, North America’s largest network of private practice optometrists, adding 105 Canadian Vision Source locations and approximately 150 optometrists to its roster. Supporting them is a unique management team that features financial, marketing and legal specialists who have expertise beyond the optical industry. The company’s critical mass has also enabled it to add attractive incentives such as its new Aeroplan partnership. FYidoctors recently acquired VEDI Corporation, which gives it the exclusive right to offer Aeroplan Miles at all of its corporate locations. There will be an opportunity for all Vision Source Canada franchise locations and other independent practices to offer Aeroplan Miles as well. Ulsifer says the goal of FYidoctors is to stay ahead of the curve by anticipating emerging technological developments and business opportunities and adapting its platform to take advantage of them. The company will introduce a new vision screening app in the coming weeks. It also plans to launch an Internet-based public portal designed to serve existing customers with branded frames, ophthalmic lenses and contact lenses. Thanks to new technology, licensed practitioners will be able to perform measurements via a virtual platform, thus enabling patients to choose the best possible products to meet their particular needs. 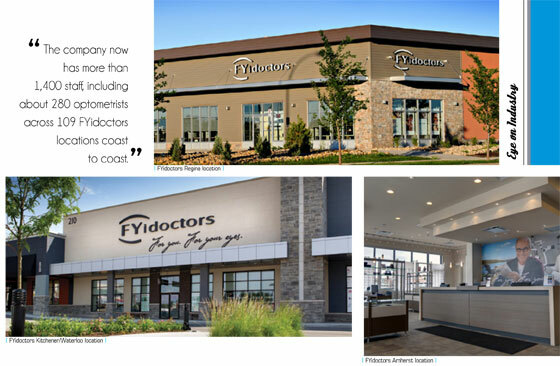 After taking a year off to implement a new practice management marketing program company-wide, FYidoctors recently embarked on an aggressive new growth phase, which began with the addition of the Vision Source franchises in October. Going forward, the company is focused on ensuring that optometrists continue to play a significant role in shaping the eyecare field in Canada. While the Canadian optical market remains strong, Ulsifer predicts that it will experience considerable disruption in the short term. That, he says, will create fantastic opportunities for innovators who are willing to challenge the status quo.